When considering expanding internationally, questions often arise when it comes to logistics, costs, risks, infiltration and more. However, there’s a big issue that’s often overlooked when it comes to successfully taking your company international. That issue is successfully establishing a global brand. We personally feel that branding is one of the more important aspects of marketing that is often overlooked. Your brand is what tells your customers who you are and why they should care. For those of you that are unfamiliar and want to know a bit more about branding, we’ve attached a quick video that will give you a better understanding of what branding is so hopefully you get a bit more out of what we have to say later. We recently came across an article in the Harvard Business Review called “The Lure of Global Branding” (found here). In this article they conducted an interview of executives from 35 companies that have successfully created a Global Brand. From these interviews 4 components of becoming an effective brand leader came to light. Luckily for you, we’ve broken down these four components so that you better understand what it takes to establish yourself a global brand leader.Stimulate the sharing of insights and best practices. This involves having to research and learn from either a company’s own or another company’s past mistakes. This is especially important when considering entering a market in another country. Businesses must gain the knowledge about how to communicate to a target market from one country to the next. Although researching doesn’t sound like a difficult job, it is often challenging to find available information to gain the right amount of insight when planning a new project. However, having a healthy company culture in which employees are satisfied urges them to work more efficiently, gaining the information necessary to correctly implement projects. This all circles back to the company’s brand since employees are truly able to embrace the brand, thus able to understand the best tactics to communicate it to customers. Increasing employee satisfaction and understanding can be accomplished in multiple ways including formal organizational meetings, using intranets for immediate communication, conducting field visits, and fully sharing all company research along the way. A common mistake several larger companies make, is not having a cohesive brand planning process across all markets. This can lead to inferior marketing as well as a weakened brand. It is critical that the process includes an analysis of customers, competitors, and the brand. It is important that there is a mutual understanding of who they’re customer it is and which part of the brand the customer resonates with most. It’s also imperative that it’s well understood who your competitors are and how you differentiate yourself in comparison to the competition. Lastly, and personally we think most importantly, is having a strong understanding of the brand itself. This includes the company’s heritage, values, core competencies, strengths, weakness, and vision. In order to successfully compile a strong global branding planning process, it’s critical that a well-established and cohesive brand is understood across all markets. Often times, when it comes to marketing, you aren’t trying to sell your product, you’re trying to sell your brand. In order to successfully execute brilliant brand-building strategies it’s important to ensure you have a strong global brand leader. A global brand leader is faced with the tedious challenge of balancing global strengths while still recognizing local differences. In order to truly have brilliant brand building you have to go beyond just advertising. A strong brand-building path with also include local sponsorship, promotions, increased retail presence, and more in order to translate that global brand image to the local culture. At the end of the day, it’s likely that there are several competitors offering similar, if not the exact same products. What differentiates you from the competition is the story behind your product. What makes you different? What do you believe in? What is your purpose? These are the questions that need to be answered and portrayed in a unified front across all markets. 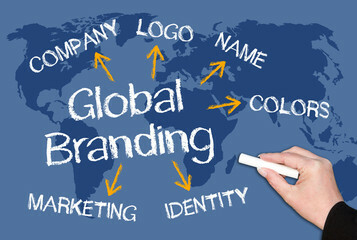 It is critical to start with a global brand image that is filtered down from a global image to specific countries. This allows a company to start with a strong core for their brand while still allowing for tweaks that better fit each individual country ultimately leading to the establishment of a strong global brand!